A new resident recently arrived at the Indianapolis Zoo. A baby Atlantic bottlenose dolphin calf, believed to be a male, was born June 3 to mother Nova. The Zoo in Indianapolis is the only location in the Midwest where you can interact with dolphins. This video shows dolphins in training. The zoo has many wonderful exhibits year-round, and summer is a perfect time to come out and explore this downtown treasure. The zoo was the first facility to receive triple accreditation as a zoo, aquarium and botanical garden. The zoo opened in 1964 and is located in White River State Park. Tiger Forest is a new exhibit featuring the zoo’s three Amur Tigers. A glass viewing area allows visitors to observe these magnificent animals close enough to count their whiskers and claws! The zoo features flora and fauna from many diverse regions around the world. Temperate and tropicalforest creatures are housed in the forests biome, meerkats and reptiles are among the residents of the deserts biome, and a plethora of African dwellers are in the plains biome. The Oceans and Marine Mammals exhibits are also chock-full of wonderful adventures! Bats and warthogs are newly featured residents, and OMG! (Odd, Magical and Gorgeous!) Orchids, showcases the beautiful flora through Oct. 30. 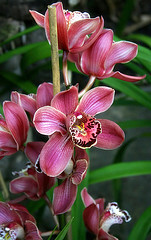 Orchid picture courtesy of aussiegal on Flicker.